So many bolts, so little time. Here’s a guide to help you figure out what the specs of almost any bolt, and tell if it’s either metric or standard. It can get really confusing sometimes when it comes to fasteners since there are just so many. 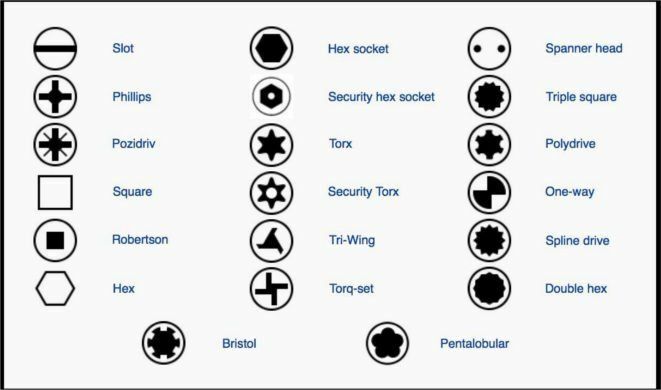 But this handy guide should help you learn the “nuts and bolts” of well…. nuts and bolts. The first three major things to consider are: Length, Diameter, and Pitch. How long is that bolt? Most bolts come in pretty uniform lengths; and this is a good way to determine if the bolt is metric or standard. Measure the bolt length (not including the cap), and see if it’s closer to a fraction of an inch, or a nice and round millimeter length that ends in 5 or 0. Sometimes bolts can be a very specific length and this way might not always work, but you should at least know the length by now. What size hole will this bolt fill? For metric this is fairly simple, the diameter is measured in millimeters (same as length). Standard is pretty simple too, inches are “usually” broken down into quarters, and smaller fractions. Once a standard bolt has a diameter of less than a 1/4, they go to whole numbers counting down from 12 to 0 (you can see this here Standard USA Bolt Dimensions). A great tool to measure bolts is a caliper, they take very precise measurments. You can find some very nice calipers on Amazon. 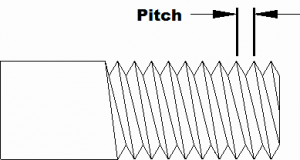 Thread pitch is the distance between the teeth on a bolt or screw. Again, metric this is pretty simple, this is measured in millimeters (notice a trend?). But it can be slightly different on standard bolts. 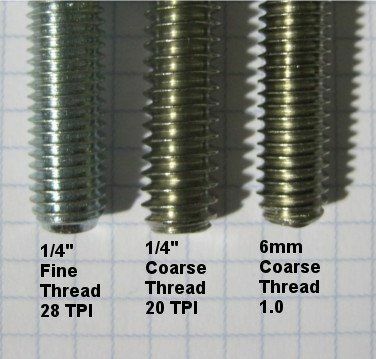 For standard bolts the thread pitch is measured by thread per inch (TPI). Something very similar to pitch (but definitely not the same as) is what is called lead (pronounced like “leed”). This is the distance the bolt covers after one complete turn. Though people measuring thread by lead is not all that common (unless you’re an engineer), it’s good to not get the two confused. 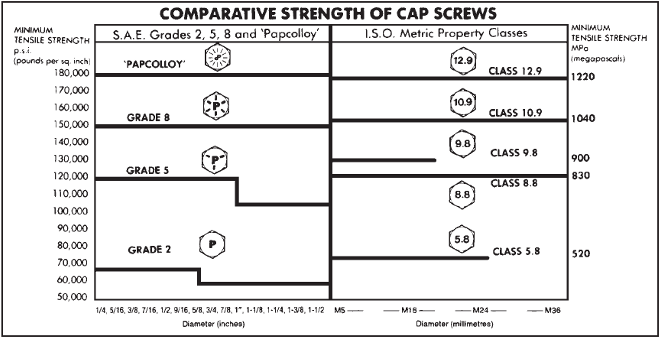 The following tables show the thread pitch of coarse and fine thread metric and standard bolts. 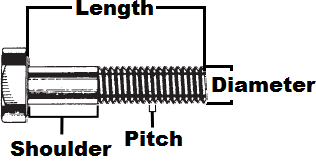 Thread pitch is measured as the distance between threads on a metric bolt. On standard bolts thread is measured by the number of threads per inch. In the picture to the left, you can see 3 bolts that look very similar at first glance when lying around your work bench. The first two are 1/4″ diameter and the last one is 6mm. As you can see, the thread pitch of the coarse metric bolt is much finer than a coarse thread standard bolt. It’s hard to tell, but the fine thread standard bolt is just slightly finer then a regular coarse thread metric bolt. For bonus points here, you will notice these bolts aren’t made from the same materials. The two on the right are stainless steel, while the one on the left is zinc plated. 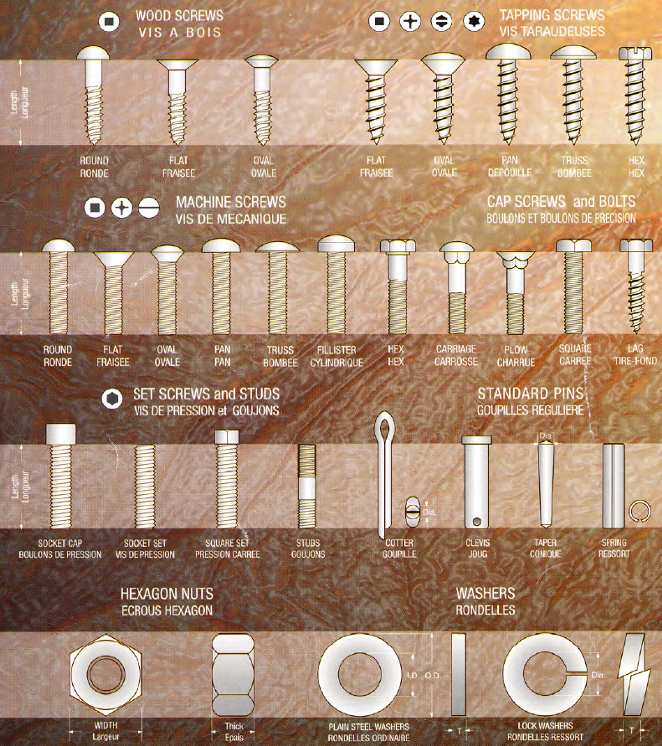 What’s the difference between a screw, machine screw, and a bolt? A questions for the ages, sometimes people get them mixed up. The question that needs to be asked is “what do they thread into?”. A screw is simple, they are pointed at one end, and they make their own thread into whatever material you’re drilling them into. A bolt usually has a flat tip and is built to work with a matching nut, and is engineered to be torqued by the nut. A machine screw is actually closer to a bolt than a screw. A machine screw threads into a nut or an insert, but unlike a bolt, it is meant to be tighted by the head of the machine screw. 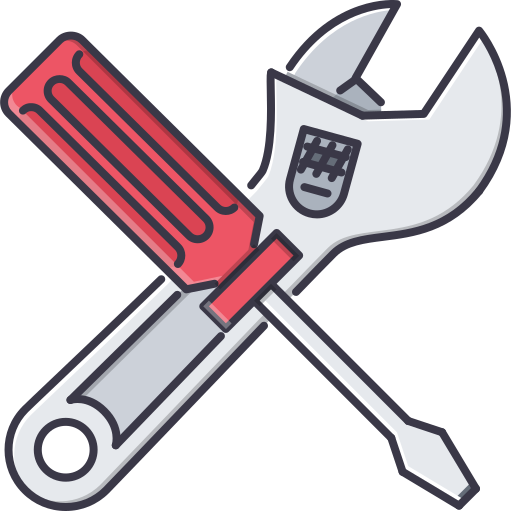 So to clarify; a screw makes its own threads and torque is applied to the head; a machine screw needs something to be threaded into, and torque is also applied to the head; a bolt is designed to be tightened by the nut. Now how are we going to drive this bolt into its hole? The picture below is a great example of head types but, tamper proof heads are always being created for obvious reasons. Some heads get stripped easier than others, for example the double hex below. The following image was taken from the back cover of the Papco 400 catalogue, and is a good example of how different heads are shaped. It really all comes down to the application. First Call doesn’t stock every type head for every type bolt, we just don’t have the space, but we can order almost anything depending on your needs. How strong is that bolt? In the case of hex head bolts, most of them come with markings. Metric bolts have numbers, standard bolts have little lines, and rusty bolts… good luck.Tensile strength is is the maximum amount of stress a bolt can endure from being stretched or pulled until it fails. Again this is only important when it comes to the application. Low grade bolts are going to work for most everyday applications, like mounting a flat screen television, or keeping your chair together. The higher grade bolts are reserved for heavier machinery that really need that extra strength. What is that bolt made out of? This can be hard to tell without a science lab, but you can sometimes tell by the colour. All metals oxidize with the only exception being gold, some just oxidize faster than others. The bolts we deal with are primarily made from steel, which is an iron alloy that rusts. Most bolts are coated with zinc (galvanization), which makes it corrosion resistant. When you start mixing different types of metal, that’s when the problems with rust can start (like steel bolts on iron). Against popular belief stainless steel does rust, but at a very slow rate. Stainless steel is just steel with varying amounts of chromium, the more chromium the more protected it is from the elements, like water. When it comes to water, you have stainless steel for fresh water (type 304) and stainless steel for salt water (type 316). Zinc plated steel is good for open air, stainless steel is good for fresh water, and “marine grade” stainless steel is good for salt water. I hope this made some sense to you, but if you’re still confused on what kind of bolt you’re looking for, please send me an email. Just send it with an attachment of a photo with your bolt and something to scale it to. I’ll try my best to help identify it. Many greedy manufacturers will make the screws and bolts of their products so hard to find that you have to call them for replacement parts; if that’s the case you might be out of luck, or require some out of the box thinking. If your looking for stainless steel bolts, we have a great selection on this site. We one of only a few retailers of metric stainless steel fasteners in Canada online. We also carry hard to find metric fine thread and very fine thread 10.9 metric bolts. If you have any other special requests please send us a message on our contact page. This entry was posted in fasteners, garage stuff, hardware and tagged brass fasteners, fasteners, information, learning, thread pitch. Get 10% Off Your Next Order Instantly! By signing up for our newsletter you’ll get all this great stuff! We respect your pivacy and will never share your personal information. We send out emails about once a month.